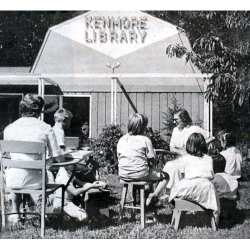 On July 21, 1958, Kenmore’s first public library opened in a former barn on 73rd Avenue NE, some 40 years before the city’s incorporation. The new library, founded by an “army of enthusiastic volunteers,” initially offered 5,600 titles. Jean Smith was the first librarian. Here, Ruth Munson leads a story-telling session for children.